In a recent study conducted by the Pew Research Center’s Project for Excellence in Journalism and Internet & American Life Project 69% of respondents said if their local paper was to disappear tomorrow they would still be able to keep up with local news and information about their community. While that number seems staggering on paper the research project has found that the impact of local print newspapers has a huge affect on most readers lives. According to the research center print and online versions of local news are the first sources that people rely on for 11 of 16 different kinds of local information. The study specifically found that issues of crime, taxes, art and culture were all well addressed by local outlets, while news about housing, schools and jobs are also well served by local newspapers. There were some areas that don’t necessarily need the help of local print and local online outlets, specifically when users look for information pertaining to local business and area restaurants where the internet dominates the market. 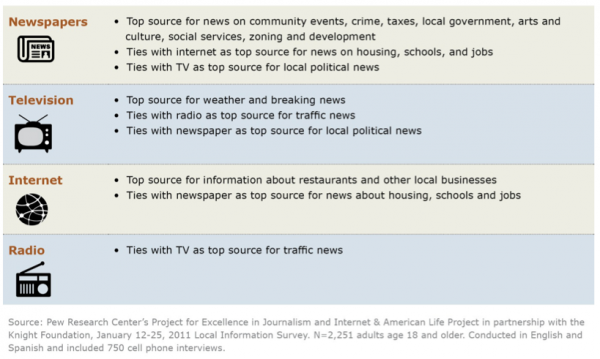 The chart shown above highlights which areas are most well served by different media mediums.